Nominated for nine Academy Awards, this "heartwarming and soul-stirring" (Variety) portrait of life on the homefront during World War II is "a magnificent picture...rich in humor [and] poignant with heartbreak" (The Hollywood Reporter). 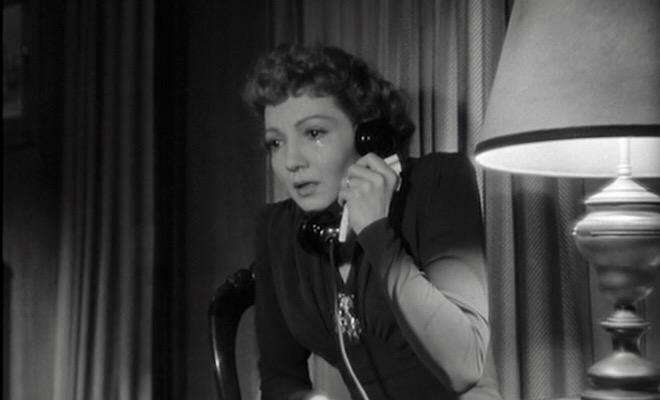 Claudette Colbert heads an all-star cast, including Jennifer Jones, Joseph Cotten and Shirley Temple, in this "beautifully produced picture that gets into your heart" (Los Angeles Examiner). With her husband Tim off at war, Anne Hilton (Colbert) struggles to be a pillar of strength for her daughters Jane (Jones) and Bridget (Temple). During America's darkest hours, she bravely steers her girls through heartbreak and hardships as she eagerly awaits news from overseas and wonders if life will ever be the same. Keep the home fires burning. That’s the message our government sent to families during World War II, so it’s no coincidence the opening titles of Since You Went Away, producer David O. Selznick’s heartfelt salute to the American homefront, are superimposed over a burning yule log. Though John Cromwell directed this almost three-hour domestic drama that chronicles how one clan copes with the absence of a beloved husband and father sent to fight overseas, the tireless Selznick oversaw every aspect of production, putting an indelible personal imprint on this excellent film that consumed his attentions and fueled his passions like no other. And that includes Gone With the Wind. 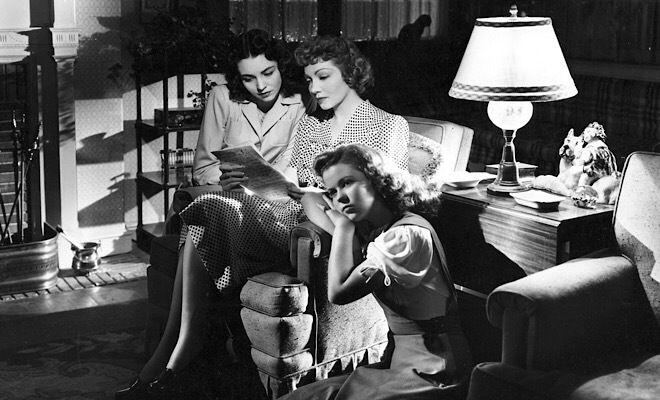 Since You Went Away marked Selznick’s first project since winning back-to-back Best Picture Oscars for GWTW and Rebecca, and he felt enormous self-imposed pressure to eclipse those impressive films. Selznick adapted Margaret Buell Wilder’s book himself and designed the production to bolster the career of his young protégé, actress Jennifer Jones, with whom he was having an affair. (The couple would marry several years later.) As a result, what should have been an intimate, finely contained portrait of a typical American family quickly ballooned into a sprawling epic featuring an enormous cast of characters. Yet the narrative’s unnecessary engorgement somehow doesn’t harm the film. Yes, Since You Went Away runs a bit long, especially during its last half hour, but remains a remarkably engrossing, well-paced picture that resembles a richly textured novel. Surprisingly, though, plot comes at a premium. The film is really just a series of episodes in the lives of Anne Hilton (Claudette Colbert), her teenage daughters Jane (Jones) and Brig (Shirley Temple), and the curmudgeonly Colonel Smollett (Monty Woolley), the aged boarder they take on after the family’s patriarch, Tim (who is never seen), departs for active duty. Tim’s best buddy, Lt. Tony Willett (Joseph Cotten), who’s always harbored a crush on Anne, pops in now and then, as does the bitchy town busybody, Emily Hawkins (Agnes Moorehead), whose highfalutin, judgmental attitudes rub almost everyone the wrong way. The Hilton’s blunt family maid, Fidelia (Hattie McDaniel), helps keep her beloved brood on solid ground, as Anne struggles with loneliness, inertia, and constant worry and Jane becomes romantically involved with the Colonel’s grandson, Corporal Bill Smollett (Robert Walker), who desperately seeks to regain the love and approval of his gruff, bitter grandfather after tarnishing the family’s prized military legacy. Multiple themes abound in Selznick’s screenplay, propelling and sustaining the flimsy narrative. Courage, patience, endurance, duty, sacrifice, altruism, acceptance, and coming of age during a trying time are only some of the issues explored, along with the plight of refugees and snobbery of a self-serving upper class. In its attempt to paint the Hiltons as if they’re subjects of a Norman Rockwell portrait, the film somewhat romanticizes the daily rigors of homefront life, but all the characters remain disarmingly relatable even as they fulfill their stereotypical roles. The natural dialogue flows effortlessly from their lips and the light comedy scenes rarely feel forced or awkward. Humanity - in all its forms - is Since You Went Away's most essential element, and it oozes from the film's every frame, especially during its myriad slice-of-life moments. Quality and attention to detail always define Selznick movies (his ceaseless tinkering no doubt limited his output and contributed to his studio’s demise), and the beautiful black-and-white cinematography, elegant production values, and memorable Max Steiner music score help ensure the film’s success. Yet one iconic scene looms above all others. The emotional train station farewell between Jones and Walker is a classic movie moment and enduring homefront image - the departing soldier clinging to his love until the very last second, followed by her desperate attempt to elongate the goodbye by running down the platform as the train chugs away. He tosses her his pocket watch as a memento and she pledges her undying love through a torrent of tears. The description may sound mawkish, but the scene is anything but, producing at the very least a sizable lump in the throat. In fact, the sequence is so famous, it was mercilessly (and hysterically) parodied in Airplane!, although sadly, few people today would be able to make the connection. All the performances strike a chord, but the work of Colbert and Jones resonates the strongest. The 39-year-old Colbert had to be cajoled into playing a mother of teenage girls, but she was rewarded with a Best Actress Oscar nomination for her beautifully modulated, utterly believable portrayal of a devoted wife and mother who breaks out of her cocoon and becomes more socially and globally aware during her tenure as head of the household. Jones, who over the film’s course evolves from a fickle, boy-crazy adolescent into a mature young woman, nabbed a Best Supporting Actress nod for her luminous turn, which was made all the more difficult by the casting of Walker, her estranged husband at the time. Watching the two gaze adoringly at each other during their achingly tender, pitch-perfect love scenes, you’d never guess they were on the verge of divorce. In all, Since You Went Away garnered nine Academy Award nominations, including Best Picture, Best Supporting Actor (Monty Woolley), Best Cinematography, Best Art Direction, Best Editing, and Best Special Effects. (The only prize it won was for Steiner’s music score.) And yet such fervent acclaim has not kept the film in the public eye. Maybe its length has worked against it (and limited its TV showings over the years) or maybe some of the propaganda and patriotism sprinkled throughout lends it an antiquated feel. Whatever the case, hopefully this superior Blu-ray release from Kino will revive interest in this sensitive and perceptive motion picture that celebrates a critical transitional period in American social history and wears its enormous heart on its sleeve. Just like movies that chronicle men in combat, Since You Went Away, despite its domestic slant, is a war movie, and though the tale it tells is a personal one, it’s no less important or influential. 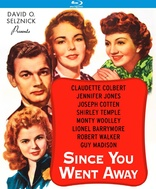 The restored roadshow edition of Since You Went Away, which includes a five-minute overture and 90-second intermission with entr’acte music, arrives on Blu-ray packaged in a standard case. Video codec is 1080p/AVC MPEG-4 and audio is DTS-HD Master Audio 2.0 mono. Once the disc is inserted into the player, the static menu with music immediately pops up; no previews or promos precede it. Restoring an almost three-hour movie from 1944 is no easy task, but I’m very pleased to report this 1080p/AVC MPEG-4 transfer from Kino Lorber exceeds my expectations and elevates Since You Went Away to new and glorious visual heights. Never have I seen this film look so clean, vibrant, and rich, and the stunning quality maximizes the impact of the Oscar-nominated cinematography by Stanley Cortez and Lee Garmes. A natural and consistent grain structure anchors the picture, enhancing the textures of clothing and furniture while maintaining a lovely film-like feel, and excellent clarity and contrast heighten the sense of depth. Black levels are lush, whites are crisp, patterns remain stable, and a nicely varied gray scale helps boost the potency of fine details. 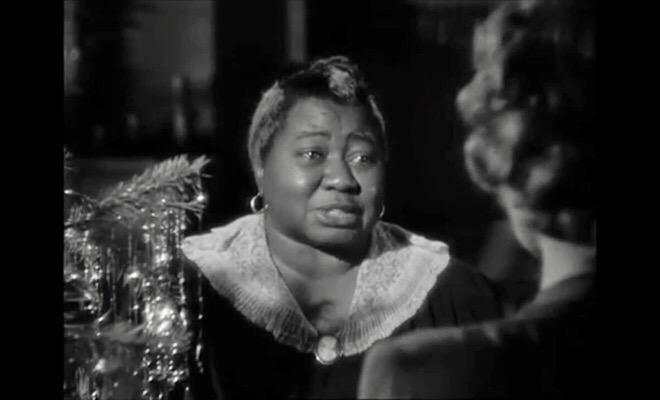 Shadows are especially deep and well defined, with sharp, elegant lines and superb delineation, and sparkling close-ups showcase Colbert’s alabaster skin, Jones’s fresh-faced complexion, the grizzled beard of Monty Woolley, and Hattie McDaniel’s liquid eyes. A few errant marks dot the pristine print, but I can probably count them on one hand - a staggeringly low number considering the movie’s lengthy running time - but crush is absent and any digital doctoring escapes notice. A couple of shots look a bit soft and/or rough, as if they were culled from a secondary source, but their impact is fleeting and in no way do they detract from the overall brilliance of this exceptional presentation. Without question, Since You Went Away has never looked better on home video, and this immersive transfer makes us feel as if we are an honorary member of the Hilton family. If you’re a fan of this film, you’ll definitely want to chuck your old DVD and embrace this top-notch rendering with open arms. Dialogue drives Since You Went Away, and the DTS-HD Master Audio 2.0 mono track properly prioritizes all conversations, which are clear and easy to comprehend. The rest of the mix is well modulated, nicely balancing the atmospherics of a cacophonous bowling alley and munitions factory, as well as the omnipresent, Oscar-winning Max Steiner music, which underscores much of the action, but never intrudes upon it. A wide dynamic scale keeps distortion at bay, and any age-related hiss, pops, or crackles have been meticulously erased. In addition, excellent fidelity and tonal depth enhance the overture and entr’acte music, which fill the room with ease. This track won’t knock your socks off, but it seamlessly complements this 73-year-old classic, which makes it a very fine effort indeed. Since You Went Away is a long film and it’s conceivable Kino Lorber didn’t want to diminish the quality of the video by cluttering the disc with a bunch of extras. Yet the lack of any supplements, aside from a collection of trailers, is still disappointing. (The previous DVD release of the film did not include any special features either.) Though the movie’s name recognition isn’t as strong as other Selznick productions, Since You Went Away deserves a retrospective featurette or, at the very least, an audio commentary, and hopefully some future edition will include either or both. Trailer Gallery (HD, 10 minutes) - In addition to the original preview for Since You Went Away, trailers for two other Selznick-Jones-Cotten collaborations - Portrait of Jennie and Duel in the Sun - as well as Cotten’s I’ll Be Seeing You and Jones’s A Farewell to Arms are included. The World War II homefront has been the focus of plenty of films and even a TV series or two, but none of them can surpass Since You Went Away. 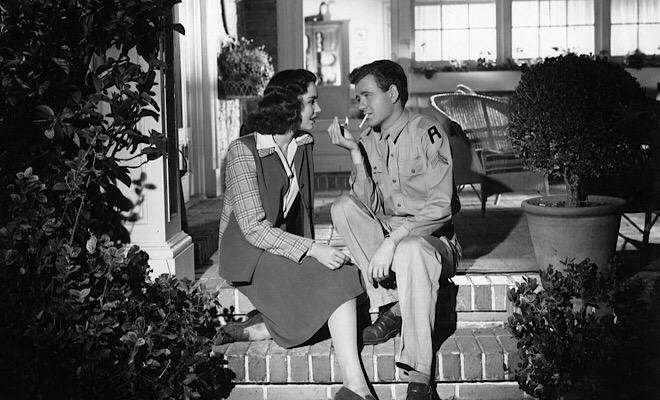 Producer David O. Selznick’s epic salute to American families and their unique and tireless contributions to the war effort remains a deeply affecting portrait of courage, love, devotion, and endurance, and an all-star cast, literate script, and meticulous direction distinguish the production. Excellent video and audio transfers make Kino Lorber’s restored roadshow Blu-ray presentation a joy to watch, and though the disc may be devoid of supplements (save for a few trailers), it still comes very highly recommended.